Other Blind spares and child safe devices available. 25mm x 24mm Head rail. 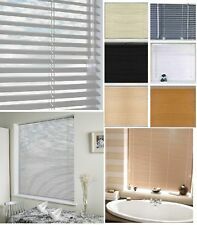 Premium Real Wood 25mm (1") slat Venetian Blinds. Box brackets that can be face or ceiling fixed, so inside or outside the recess. Real Wood Venetian Blind. 60cm (approx 2ft) wide. Cords to operate blind up and down on right. Premium Real Wood 25mm (1") slat Venetian Blinds. Box brackets that can be face or ceiling fixed, so inside or outside the recess. Real Wood Venetian Blind. 60cm (approx 2ft) wide. Oak stained finish. Premium Real Wood 25mm (1") slat Venetian Blinds. 160cm max drop. Box brackets that can be face or ceiling fixed, so inside or outside the recess. 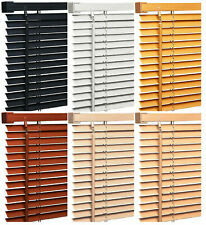 Real Wood Venetian Blind. 90cm (approx 3ft) wide. Cords to operate blind up and down. Other Blind spares and child safe devices available. 25mm x 25mm Head rail. Premium Real Wood 25mm (1") slat Venetian Blinds. 160cm max drop. 75cm (approx 2ft 6in) wide. Real Wood Venetian Blind. Cords to operate blind up and down. These are premium quality hardwood venetians, new. Slide-in fixing plate holds the blind in position. 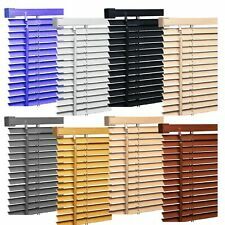 Premium Real Wood 50mm (2") slat Venetian Blinds. Real Wood Venetian Blind. 90cm (approx 3ft) wide. These are premium quality hardwood venetians, with tapes. Oak stained finish. 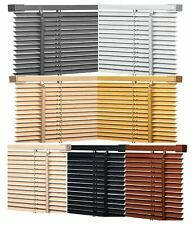 50mm slats. Cords to operate blind up and down. 1 pair of swivel/spider type universal fixing brackets (fittings) for 25mm 1" venetian blinds. Swivel arm fixes top rail onto the bracket. Premium Real Wood 25mm (1") slat Venetian Blinds. Acacia stained finish. Box brackets that can be face or ceiling fixed, so inside or outside the recess. Real Wood Venetian Blind. 60cm (approx 2ft) wide. CHEAPEST ON EBAY and CHILD SAFE. Best Quality on EBAY. NEED TO SECURE THE BOTTOM OF A 25MM VENETIAN BLIND TO A DOOR OR WINDOW ETC?. HERE IS THE SOLUTION. 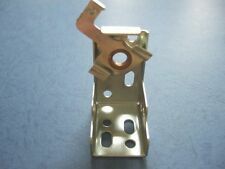 1 PAIR OF HOLD DOWN BRACKETS SUITABLE FOR 25MM SLATTED BLINDS. UNIVERSAL FIX VENETIAN BLIND BRACKET. LOST OR BROKEN VENETIAN BLIND ?. BRACKETS THESE ARE AN IDEAL SOLUTION. THESE BRACKETS ARE FOR 25MM SLATTED VENETIAN BLINDS ONLY. 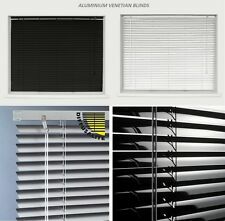 THEY CAN BE TOP OR FACE FIXED AND WILL FIT OVER 98% OF ALL 25MM VENETIAN BLINDS THAT ARE CURRENTLY ON THE MARKET. 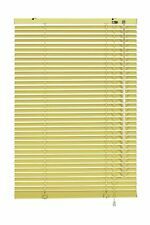 Premium Real Wood 35mm (1.5") slat Venetian Blinds. Box brackets that can be face or ceiling fixed, so inside or outside the recess. Real Wood Venetian Blind. 60cm (approx 2ft) wide. Oak finish. Cords to operate blind up and down. 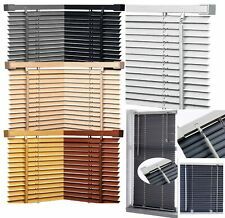 Premium Real Wood 35mm (1.5") slat Venetian Blinds. Box brackets that can be face or ceiling fixed, so inside or outside the recess. Real Wood Venetian Blind. 90cm (approx 3ft) wide. Cords to operate blind up and down. HEAVY DUTY AND WITH A FRONT SWIVEL ARM THAT LOCKS BRACKET INTO PLACE. PRICE IS PER BRACKET. WILL FIT A TOP BOX SECTION OF APPROX 53MM(from back to front). Other Blind spares and child safe devices available. 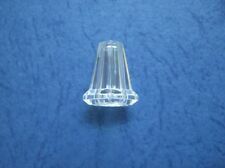 Fits 25mm x 25mm top head rail. Venetian Blind Cleaner With 7 Cleaning Brushes. 1 x 7 Brush Venetian Blind Cleaner. The brush is specially designed to easily clean all types of blinds and shutters. Easy grip handle. Attracts all kinds of dust and dirt with minimal effort - Instructions included. Other Blind spares and child safe devices available.